But now it has a new cover and a new title! It is the same book with the same story that kids love! Over 122,000 copies in print! Print and Kindle versions can be purchased at Amazon (USA) by clicking here. It is also available in print and Kindle versions at Amazon's numerous worldwide sites. It is also available from Illusion Publishing. The audiobook is available at Amazon, Audible, and iTunes! Summary: Anthony Madison, a.k.a. Tony Baloney, can’t get enough of the Late Show with David Letterman. He loves the Late Show and will stop at nothing to get himself on the program. But to get from Kansas City to New York City, he’ll have to pull out all the stops. With his own brand of Top Ten lists, and stunts that range from photocopying his hinder to taking to the field in a bear suit at a professional football game, Tony takes the NFL, MTV, New York City, the Hells Angels, his teacher, friends, family, and readers on an uproarious ride to remember. Buy cool Top Ten things in the Top Ten Kids Store! 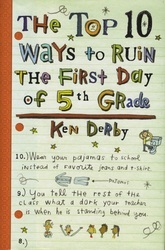 Originally published as The Top 10 Ways to Ruin the First Day of 5th Grade. Hardcover originally published by Holiday House. Paperback originally published by Scholastic. Paperback re-released by Illusion Publishing. 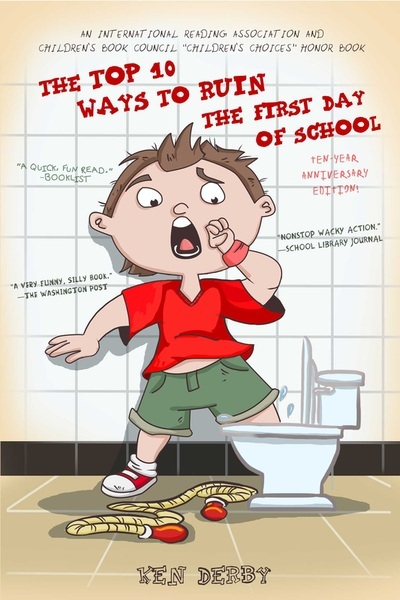 The Top 10 Ways to Ruin the First Day of 5th Grade was honored as a "Children's Choices Novel for 2005" by the Children's Book Council and the International Reading Association in 2005! It was also published (in September of 2005) by Scholastic's Book Club Division as The Top 10 Ways to Ruin the First Day of School! 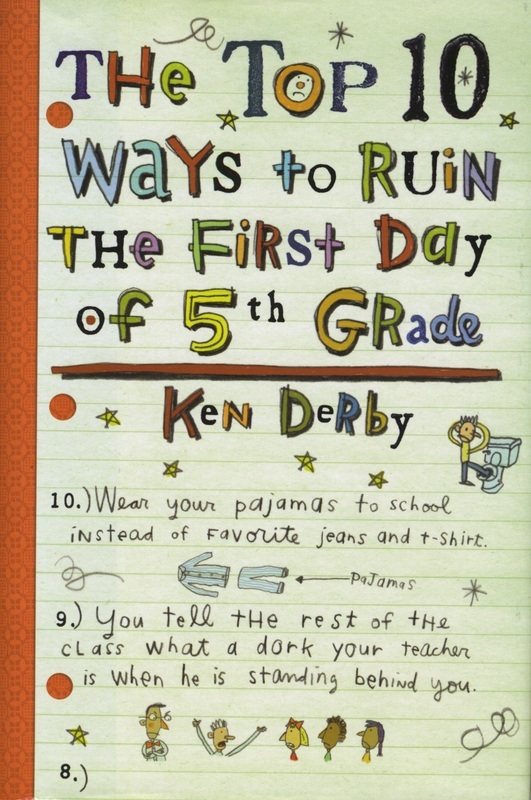 In 2006, Alabama students voted The Top 10 Ways to Ruin The First Day of 5th Grade, as their favorite book in the grades 4-6 category. The Emphasis on Reading, Children’s Alabama’s Choice Book Award Program, is sponsored by the Alabama Department of Education. Fifth-grader Anthony Madison is a magnet for trouble. Irrepressible, unstoppable, and outrageous, he is constantly thinking up ways to make it on to David Letterman's show. He has his own collection of stupid human and pet tricks that he is sure will be his ticket to New York. After trying each new prank, he writes to the talk-show host and includes a top-10 list detailing his stunts. Unfortunately, most of these exploits end up with Tony in the principal's office and his teacher, Mr. Gore, going home to change his clothes. One of his feats finally earns him the sought-after invitation (he makes the national news when he runs onto the field dressed as a bear during a professional football game). Tony, two of his friends, and Mr. Gore travel to New York City where Tony proceeds to wreak his own brand of havoc on the Big Apple. It all culminates with his arrival on the “Late Show” escorted by Hell’s Angels on motorcycles. Humorous and lighthearted with a feisty and zany main character, this book will be enjoyed by readers who like off-beat plots and nonstop wacky action. – Terrie Dorio, Santa Monica Public Library, CA. Copyright © Reed Business Information, a division of Reed Elsevier Inc.
Fifth-grader Anthony Madison is enamored of David Letterman's Late Show--especially the jokes, the Top 10 Lists, and Stupid Human Tricks. Determined to appear on the show as a guest, he attempts outrageous acts, including getting his foot stuck in a toilet, starting a food fight in the cafeteria, and photocopying his bare bottom in the teachers' workroom. After he creates a disturbance at a professional football game (he steals the ball and runs for a touchdown in a bear costume), Letterman invites him on the show, and the trip to New York, accompanied by two friends and his teacher, proves to be just as over-the-top as Tony's life back home. Derby's characters are long on high jinks and short on introspection; indeed, Tony's lack of growth will probably grate on most adults. Kids, however, are likely to admire Tony's audacity, even as they realize that no real kid could ever pull off the stunts. A quick, fun read that will appeal to would-be show-offs everywhere. – Kay Weisman. Copyright © American Library Association. When kids think about school at all during the summer, it is usually with either relief that it is over or dread that it will soon resume. There ought to be a third alternative, and Scholastic may just have one: think about school as something to laugh about. This can be easier to do when you’re not there, especially if you are a recent or rising fifth-grader. Both Sarah Weeks’ book and Ken Derby’s are fifth-grade adventures – and since both are fairly thin paperbacks, they’re just fine for a trip to the beach or for reading outdoors (or indoors, if the weather won’t cooperate). Danger! Boys Dancing! gives the two fifth-grade Boyd boys – that’s Nat Boyd and his best friend, Boyd Fink – a taste of culture that they’d just as soon not have: a class assignment that involves dancing, and maybe even ballet. Mrs. West tells the class, “Modern dance is about finding the emotion within and using the body to express it outwardly to the world,” but the Boyds mostly want to figure out how not to do any of it. There are misunderstandings, of course, and when the performance comes around, it turns out that there really is danger in having Nat Boyd dance. But everything remains lighthearted and good-humored. 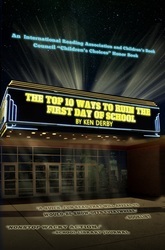 The same is true of The Top Ten Ways to Ruin the First Day of School, which was originally published two years ago as The Top Ten Ways to Ruin the First Day of 5th Grade. 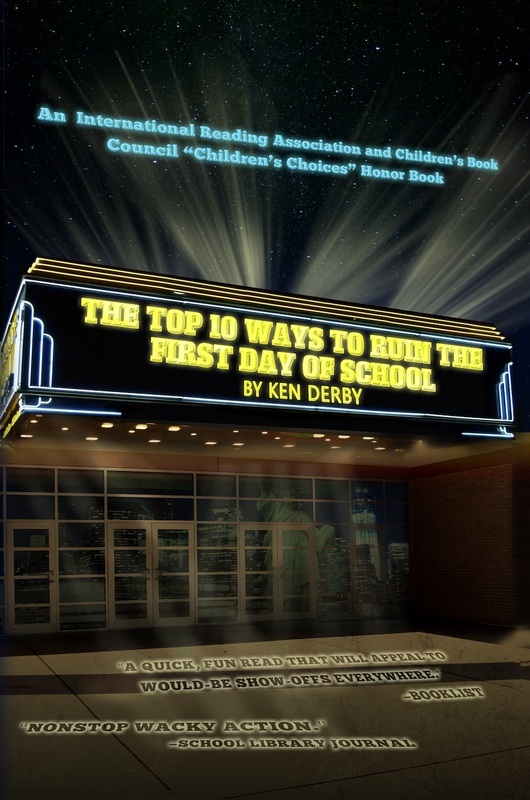 Actually, there are more than 10 ways to ruin the school year here, and Tony Madison – also known as Tony Baloney – is responsible for pretty much all of them. Tony is the class clown, and he has an obsession: The Late Show with David Letterman. Tony’s antics are all designed to get him an appearance on the show. How does a young boy from Kansas City make it to the big time in New York? It doesn’t spoil the book to note that Tony succeeds in what he wants to do – because it is the way he succeeds, and the aftermath, that are really what the book is about. There’s plenty of fun and fluff here for summer reading.– Copyright@TransCentury Communications, Inc. 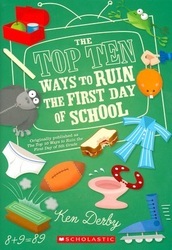 The Top 10 Ways to Ruin the First Day of 5th Grade/School is also mentioned at David Letterman’s Wikipeida page. Scroll down to the end of the “Outside of Television” section and you will read two very exciting sentences about the Top Ten books!